(A) Family pedigree: an arrow indicates the proband; half-filled indicates distal weakness in parents who were heterozygous for p.Arg140Gly mutation. (B) Biopsy of the quadriceps muscle performed at age 27; (B.a) modified Gomori trichrome staining shows variation in fiber diameter and prominent vacuoles within many muscle fibers, arrows; (B.b) Periodic acid–Schiff preparation showed no evidence of glycogen accumulation within vacuoles (arrows); (B.c) ATPase pH 9.5 demonstrates that vacuoles are predominantly in darkly stained type 2 fibers, arrows; and (B.d) ultrastructural examination of the muscle revealed electron-dense material within vacuoles (arrows). (C) Muscle MRI demonstrating severe widespread fatty infiltration of pelvic, thigh, and calf muscles with relative sparing of the adductor longus (red arrows). (D) Conservation of HSPB1 and HSPB5 (CRYAB) amino acid sequence between species. The Arg140 residue in HSPB1 is well conserved and corresponds to the position of Arg120 in the CRYAB gene. She re-presented at age 57 following the development of slowly progressive severe upper and lower limb weaknesses. On examination at age 57, there was evidence of distal more than proximal upper limb weakness affecting wrist extension (Medical Research Council [MRC] grade 4+/5), finger extension (4 + 5), first dorsal interossei (1/5), abductor pollicis brevis (3/5 right and 4/5 left), and abductor digiti minimi (3/5 right and 4/5 left). In the lower limbs, she had severe proximal weakness (grade 2/3) with no movement at the ankles. Sensory modalities were preserved except for reduced vibration sense at the ankles. She was areflexic. Her CK level was 404 IU/L. Neurophysiologic studies suggested an axonal motor neuropathy. Sensory nerve action potentials were, nevertheless, at the lower limit of normal for amplitude in the lower limbs (right sural 6 μV, right superficial peroneal 7 μV, and normal range >5 μV), and distal lower limb motor responses were absent. Needle EMG showed prominent chronic neurogenic changes with large motor units recruiting in reduced numbers but at increased firing rates to a reduced interference pattern. This EMG pattern was most pronounced distally but evident proximally in the upper and lower limbs. No low amplitude or brief polyphasic motor units were seen on any occasion at re-presentation. Muscle MRI was performed, showing widespread severe muscle fatty replacement (figure, C). There was no relevant family history. Her mother has diabetes and her father a right above knee amputation for peripheral vascular disease. Neither had neurologic complaints. However, clinical examination of both in their 80s revealed mild distal weakness (MRC grade 4/5) in the upper and lower limbs with areflexia. Pinprick sensation was reduced to the mid-forearm and foot in her mother. Her father had reduced vibration sense to the left ankle. Neurophysiologic testing was not possible in either. Our patient presented at age 19 with clinical and biopsy features consistent with a distal myopathy. Prominent vacuoles in type 2 fibers contained granular, electron-dense material (figure, B) that was interpreted to represent the product of myofibrillar degeneration.1 At presentation, neurophysiologic studies did show fibrillations and polyphasic action potentials. However, nerve conduction studies were normal with the exception of 1 absent motor nerve response, and overall, the clinical image was felt to represent a distal myopathy at this time. Subsequent neurophysiologic studies performed at age 57 following progressive limb weakness revealed an axonal motor neuropathy. Although chronic end-stage myopathy may have neurophysiologic features that can appear neurogenic, in this case, even the less affected proximal limb muscles failed to demonstrate any myopathic motor units or myopathic recruitment. Mutations in HSPB1, HSPB3, and HSPB8 are classically associated with motor neuropathy.4 HSPB5 (CRYAB) has been associated with a wide spectrum of clinical manifestations including desmin-related myofibrillar myopathy. The protein position of the Arg140Gly HSPB1 mutation in our case corresponds to the Arg120 HSPB5 residue mutated in this myopathy (figure, D).4 Heterozygous mutations in HSPB8 have recently been reported causing neuropathy and distal myopathy with rimmed vacuoles and fibrillar aggregates in 2 families.5 Subsequently, distal myopathy and neuronopathy have been attributed to an HSPB1 mutation in 1 family.6 We describe a patient with a homozygous HSPB1 mutation also presenting with a distal vacuolar myopathy, motor neuropathy, and minimal sensory involvement, supporting the association of HSPB1 mutations with this phenotype. This expands the genetic testing indicated in distal vacuolar myopathy.
. Distal myopathy with focal granular degenerative change in vacuolated type 2 fibers. Clin Neuropathol 1988;7:249–253.
. 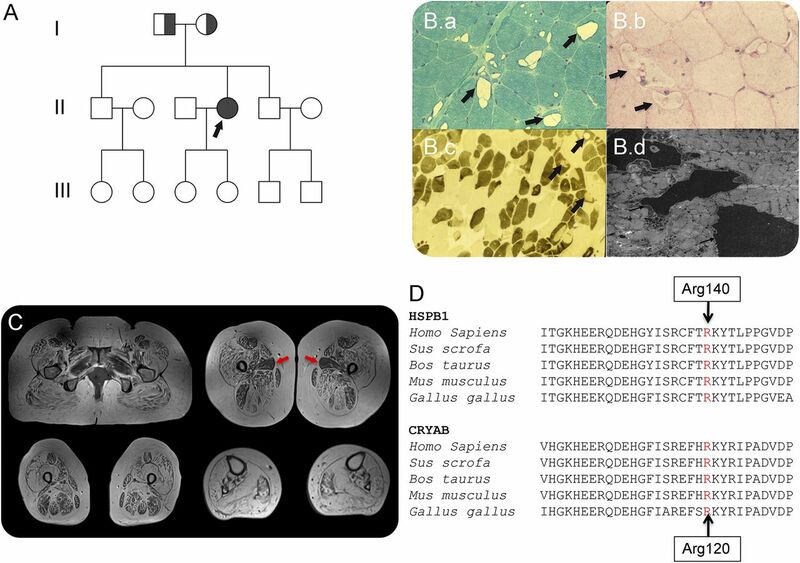 Pilot phenotype and natural history study of hereditary neuropathies caused by mutations in the HSPB1 gene. Neuromuscul Disord 2017;27:50–56.
. Muscle develops a specific form of small heat shock protein complex composed of MKBP/HSPB2 and HSPB3 during myogenic differentiation. J Biol Chem 2000;275:1095–1104.
. Neuropathy- and myopathy-associated mutations in human small heat shock proteins: characteristics and evolutionary history of the mutation sites. Mutat Res Rev Mutat Res 2014;76:15–30.
. Novel HSPB1 mutation causes both motor neuronopathy and distal myopathy. Neurol Genet 2016;2:e110. doi: 10.1212/NXG.0000000000000110.